We thoroughly enjoyed our participation in a 'Day of Design' at the Mayflower Grace. The event took place onSaturday, June 14thwhen an engaging group of panelists and moderatorsgathered at the 5 Star Relais & Chateaux property.The day included morning and afternoon panels, lunch and a VIP 'Meet the Designer' Cocktail Party. Pictured her is top designer blogger CJ Dellatore,Architect Harold Tittmannwith interior designers Susan Bednar Long and Glenn Gissler. The first morning panel, Global Finds: Searching the World for the Unique and the Unusual. brought together Richard Lambertson and Suzanne Cassano of Privet House with David Whitman and Peter Stiglin of Pergola to discuss shopping excursions to Morocco, France, India and Japan. The second morning talk covered Tabletop: Inspirations for Summer, a subject that melds aspects of design with the art of entertaining. The three panelists had rich backgrounds. Stacy Kunstel is a designer, stylist and a writer for national magazines. She also founded the design company Dunes and Duchess with her husband, photographer Michael Partenio. Amy Beth CuppDragooof ABCD Design is an artist, designer and stylist who splits her time between New York and Litchfield County. These two ladies were joined byinterior designer Ron Norsworthy who has worked with many cultural icons and celebrities including Tyra Banks, Mariah Carey and Madonna. 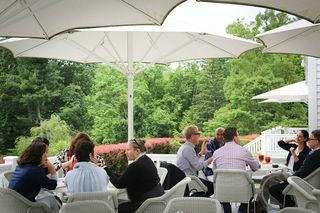 There was a spectacular lunch on the patio with all the designers, moderators and participants. The afternoon panels were again fascinating with top design professionals in the area. First up was Art, Fine Art Photography and Wall Decoration in Interior Design. 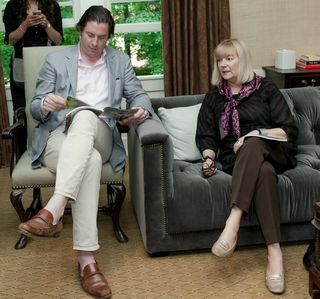 Dynamic interior designers Philip Gorrivan and Florence de Dampierre were joined by KMR Arts gallery owner Kathryn McCarver Root. KMR Arts has become quite a cultural force in the county especially after a groundbreaking exhibition of Diane Arbus photographs just last year. 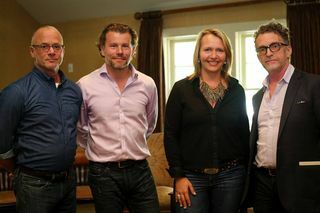 Following this panel was a discussion of Architectures Influence on Interior Design with internationally renowned Robert Couturier who is included in Architectural Digests prestigious annual list of the best decorators and architects in the world. Joining him on the panel were Robert Passal, a NY and Miami based architect and designer and Brussels born architect Harold Tittmann, who has designed some exquisite residences in the county. Here I am with the author Annie Kelly in between panels. Themoderators for the panels were two of the most preeminent style setters and design mavens in the industry. Our friend, Susanna Salk, a Litchfield County resident is a prolific author of highly regarded design books including Room for Children, Weekend Retreats, C.Z. Guest: American Style Icon, Be Your Own Decorator (all Rizzoli) and A Privileged Life: Celebrating Wasp Style (Assouline).Stacey Bewkes, founder and writer of Quintessence, has a mantra to Experience, inspire, inform its all about living well with style and substance. A great day with great designers!